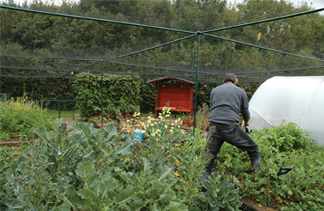 Why buy a fruit and vegetable cage? You’ve given time, love and money to growing your chosen crop only for it to be destroyed by birds and animals. Is there anything more disheartening? The simple answer to avoid this is to invest in a quality cage. You’ve planned your planting, tended it carefully in the early stages only to be left frustrated and demoralised as your appetite is whetting at the promised results. You may have tried covering your plants with various odd bits of netting, but this can be limited in its efficacy. Using fruit and vegetable cages has so many advantages with mouth watering results. The convenience of simply walking into your protected fruit and vegetable patch will be a delight for you and the envy of friends and fellow growers. Can you imagine how others will feel when your crop survives pest attack whilst theirs has not?! The ability to extend your growing area as you see fit is a huge advantage. The wide range of William James accessories means you can easily add to the size of your cage as well as changing nets depending on the pests you wish to keep out. Different meshes can be used to keep birds, butterflies, rabbits and deer off your precious produce. After 60 years of manufacturing fruit and vegetable cages we are confident in our ability to provide the best possible products to our customers. The manufacture of such high quality cages year after year can only be sustained by skilled and dedicated staff who take pride in the products that they offer to you. This quality is produced by hand in our Dorset factory. The consistent demand for our fruit and vegetable cages can be attributed to our insistence on good customer service, value for money and, above all, the undoubtedly high standard of the cages we create. 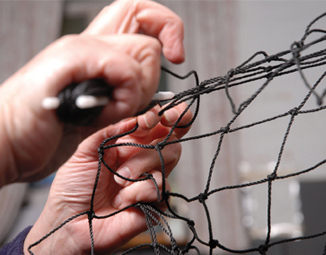 We are able to maintain this level of service because the traditional skills, such as net making, have been handed down by those who have been a vital part of William James for many years. Of course other cages are available elsewhere. But will they be as durable, reliable and produced with such care as the ones that we send out from our home here in Dorset? We have included a few testimonials from satisfied customers, whom we thank for taking the trouble to contact us. If you decide to choose a fruit and vegetable cage from William James, we sincerely hope that you will be equally impressed.